In this display, the point on the far right appears to be an outlier, spending more per capita than other nations but not fitting the general trend of increasing life expectancy as spending increases. When you see an apparent outlier, you want to investigate. 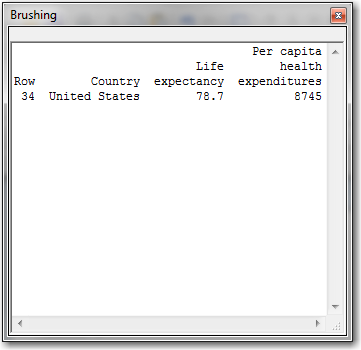 Brushing is a feature in Minitab that makes it easy to investigate outliers in graphs. For example, from the scatterplot in Minitab, you can fit simple regression models with and without the suspected outlier to see how great the influence is on the model. You can copy and paste the data at the end of the post if you want to follow along. From the gallery of scatterplots, select Simple. Click OK. In Y variables, enter ‘Life Expectancy’. In X variables, enter ‘Per Capita Health Expenditures’. Click OK. Choose Editor > Set ID Variables. 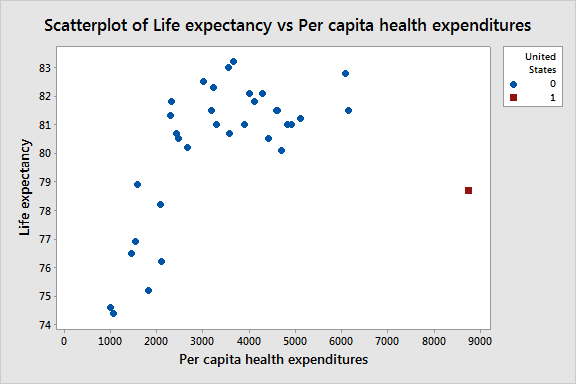 In Variables, enter Country 'Life expectancy' 'Per capita health expenditures'. Click OK.
On the graph, click and drag to cover the unusual point. In the brushing window, you can see that the unusual point is the United States, row 34 in the data set. 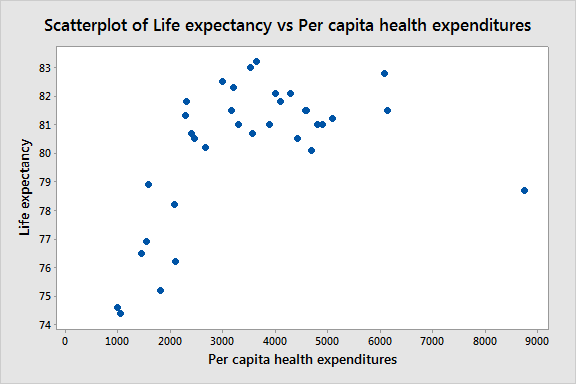 You can also see the specific values of life expectancy and per capita health expenditures. With the brushing window still showing, choose Editor > Create Indicator Variable. In Column, enter United States. Select Update now. Click OK. Choose Editor > Select Item > Symbols. Choose Editor > Edit Symbols. 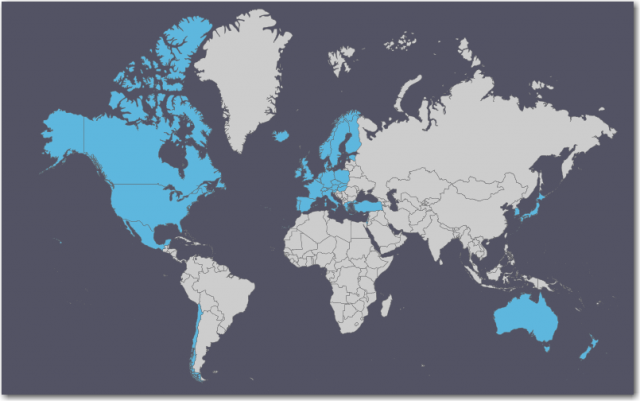 In Categorical variables for grouping, enter ‘United States’. Click OK.
With groups on the graph, you can do separate regression fits for the groups. Choose Editor > Add > Regression Fit. Check Apply same groups of current displays to regression fit. 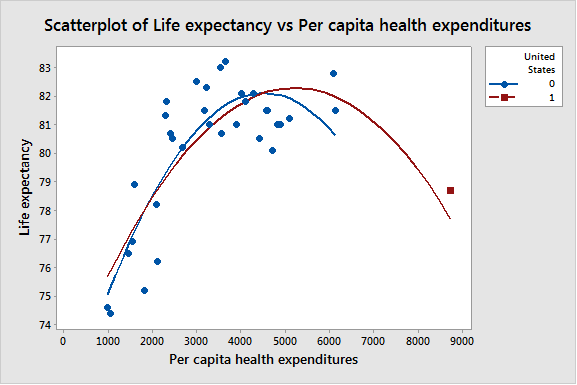 Click OK.
On the graph, the red curve shows that when you include the United States in the data, the decrease in life expectancy is slower than when you exclude the United States. Bonus tip: Hover over each curve in Minitab to see the regression equation used to create the curve. Brushing is a great tool in Minitab for investigating specific points on a graph, but it doesn’t just work on scatterplots. If you’re ready for more, you can see the complete list of graphs you can brush and how to make a graph that excludes brushed points. Prefer an example? Check out how Patrick Runkel uses brushing to study the relationships on a bubble plot! Here’s the data for the per capita health care expenditures in United States dollars and the life expectancy for the total population at birth.